Summary and Definition: The Washoe tribe were nomadic hunter gatherers who inhabited lands occupied by the Great Basin cultural group. The Washoe tribe inhabited the Sierra Nevada Mountain Range that forms the border between present-day Nevada and California. The neighbours of the Washoe tribe included the Koso, Paiute, Panamint, Walapi, Ute and the Shoshone tribes. What was the lifestyle and culture of the Washoe tribe? The Washoe tribe were originally seed gathers and hunters from the Great Basin cultural group of Native Indians. The Washoe tribe lived on the Sierra Nevada Mountain Range in small family groups in small camps of grass houses or temporary wikiups. They spent most of their time gathering food and were dependent on fishing at Lake Tahoe and the nearby streams. The Washoe tribe never hunted animals for “sport” and the hunters always prayed to the Maker and asked for forgiveness for taking a life. Plants were never gathered unless they were going to be used and the tribe always thanked the Maker for their food. The tribe used canoes to travel across the waters. The Great Basin social and cultural patterns of the Washoe tribe were those of the non-horse bands. The Washoe tribe were skilled basket makers and wove the baskets so closely that they could contain the smallest of seeds and hold water. Neighboring Native Indian tribes of the Washoe were the Ute, Koso, Paiute, Panamint, Pueblo, Walapi and the Shoshone tribes. They were long-time enemies of the Northern Paiute who drove them from their tribal lands in Nevada to California. The white settlers that were clamouring to get to the California Gold fields or the Comstock Lode silver passed through Washoe lands. Some traders and settlers decided to stay, cut down trees and ruined the Pine Nut forests and trampled across the grasses that had once provided the Washoe with their means to survive. What were the rituals and ceremonies of the Washoe tribe? The rituals and ceremonies of the Washoe tribe and many other Great Basin Native Indians included the Bear Dance and the Sun Dance which first emerged in the Great Basin, as did the Paiute Ghost Dance. The Healers of the Washoe tribe used sacred items, such as eagle feathers and cocoon rattles, to assist in rituals and ceremonies. Another important ceremony of the Washoe tribe was the Round Dance and the Pine Nut dance which ere associated with the harvest pinyon (pine nut) and was performed in supplication for increased food supply and bringing rain. Washoe myths and legends tell of mythical creatures with special powers such as those they called “Water Babies” that they believed inhabited all bodies of water. “Water Babies” sometimes caused illness or death, but could also be an omen of good fortune. Another Washoe mythical creature was a giant man-eating bird they called "Ong" that nested in the middle of Lake Tahoe. What language did the Washoe tribe speak? 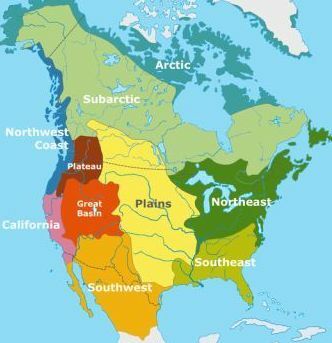 The Washoe tribe spoke in their own unique language, which was markedly different from that of the Uto-Aztecan language that was used by other tribes that inhabited their region. Their name of their tribe derives from the Washoe word, waashiw (wa·šiw), meaning "people from here." Where did the Washoe tribe live? The Washoe are people of the Great Basin Native American cultural group. The location of their tribal homelands are shown on the map. The geography of the region in which they lived dictated the lifestyle and culture of the Washoe tribe. What did the Washoe tribe eat? 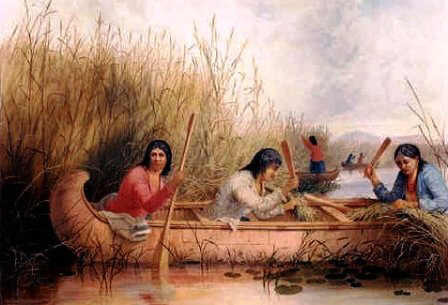 The food that the Washoe tribe ate included Indian rice grass, also known as sandgrass, Indian millet, sandrice and silkygrass. Rice grass occurs naturally on coarse, sandy soils in the arid lands throughout the Great Basin. Other common names are sandgrass, sandrice, Indian millet, and silkygrass. The seeds of rice grass were a staple food of Native American Indians, including the Washoe tribe, who lived in the Great Basin area. What did the Washoe tribe live in? Wikiups: The Great Basin Washoe tribe lived in temporary shelters of windbreaks in the summer or flimsy huts covered with rushes or bunches of grass called wikiups. The materials used were sagebrush, willow, branches, leaves, and grass (brush) that were available in their region. Grass Houses: The more permanent winter homes of the Washoe were called Galais dungal (winter houses). These grass houses consisted of cone-shaped huts that were built using a frame of willow boughs and covered with reeds, branches and grass. The Washoe grass house was rounded at the base and at the top of the dome was an open smoke hole. Rocks were piled around the base of the grass house for added insulation. Occasionally these domed grass houses were built over a 2 - 3 foot foundation. Bark and sometimes earth was added to the Washoe grass house covering to keep out the cold. The clothes worn by the Great Basin Washoe men traditionally consisted of breechcloths or aprons made from sagebrush bark. In cold weather they wore twined bark leggings and poncho-like shirts. Washoe clothes were made from fibers harvested from sagebrush bark and tule (a type of bulrush). The fibers were dampened and then pummeled by the women of the Washoe tribe until they could be woven or twined. Robes, or cloaks, were made from furs, especially rabbit fur, for added warmth. Trade with the white settlers also provided blankets for the Washoe tribe. The clothes worn by the Washoe women were knee length woven fiber aprons as a single front covering or double apron that covered the front and the back. The tribe's clothing also included clothes made of buckskin if deer inhabited their regions. Washoe clothing for both the men and women was adorned with fringes and feathers and jewelry made from beads and shells. With the advent of the white traders, western clothes were then worn by the Washoe triibe. What weapons did the Washoe tribe use? The weapons used by the Washoe tribe were primitive and included bows and arrows, stone knifes, spears, rabbit sticks and digging sticks. Washoe History Timeline: What happened to the Washoe tribe? The following history timeline details facts, dates and famous landmarks of the people. The Washoe timeline explains what happened to the people of their tribe. What happened to the Washoe tribe? There are now two bands of the Washoe Nation, the Confederated Tribes of the Washoe Reservation of Wendover that covers 112,870 acres, Utah/Nevada and the Skull Valley Band of Washoe located at Tooele County, at Skull Valley, Utah that covers 17,920 acres.